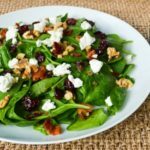 A salad made with fresh spinach, walnuts, cranberries, bacon, goat cheese, and tossed with a warm bacon dressing. Cook the bacon in skillet over medium heat until crispy. Transfer bacon on a plate with paper towels. Pour the bacon fat in a heatproof measuring cup. You will need 1/4 to 1/3 cup for the dressing. If necessary, add enough olive oil to make what you need. Pour the fat/oil back into the pan. Add the finely chopped shallot and cook until translucent. Add the thyme and cook for a minute or two. Stir the sugar into the vinegar and then add to the pan. Season with pepper. Cook for a few minutes to concentrate and lower the acidity of the vinegar. Add the dried cranberries and stir. Turn off the heat & let the cranberries soak up the dressing for a few minutes. Chop the bacon into smaller pieces. In a large bowl combine the spinach, bacon, thinly sliced shallots, and walnuts. Pour the dressing over the salad and toss to combine. Put salad on plates or in bowls and top with crumbled goat cheese. Enjoy! If you like the salad more or less oil-y or vinegar-y then adjust amounts of each to your preference. Likewise for toppings, increase or decrease amounts as desired.